You are here: Home / Indie / Monoplasma introduces itself to the nation….live! Monoplasma introduces itself to the nation….live! Reviewed by Patrick O’Heffernan on August 9, 2018 . Monoplasma introduces itself to the nation….live! (Los Angeles) In the video for their song “Te Llevo” the two founding members of Monoplasma, Hector Geronimo and Cesar “El Vampira” Lopez, are reading a comic booklet in a Volkswagen while they tour the country. The booklet, a copy of the one slipped into hard copies of the single ”Te Llevo”, described the “#tourintermidable”, a national tour they have embarked on to present themselves to audiences nationwide. The presentation is necessary even though both Geronimo and Lopez were familiar faces to legions of fans in both Europe and the United States. Lopez was the guitarist for Jaguares, Azul Violeta, and Maná, the most popular Latin band in history. Geronimo, named Best Vocalist of 2016 by HG Radio Mexico, was a the vocalist and frontman for Moebio, the Madrid-based alternative rock band that filled stadiums throughout Europe. Separately each artist has toured dozens of cities, played hundreds of concerts, and met thousands of fans. Now, as Monoplasma, they are introducing themselves to fans old and new across North and Latin America When I sat down with them in April as they were beginning #tourinterminable they were hoping their live performances excited fans as much as their album “1” excited them. They need not have worried. Last week in Glendale’s cavernous Giggles Nightclub, they not only packed the venue, but generated the kind of excitement that I think will soon have them in front of Maná-sized crowds. Their live music is nuclear-powered fun and their stage presence is iconic. Power and love and electricity pour off the band in waves and engulf you whether you are dancing in front of the stage or head banging way in the back. But the excitement was more than the music. Geronimo is a born performer who projects energy in every move, facial expression and word. With his long muscular arms, large frame, shock of blond hair and mile-wide smile, he can reach the cheap seats like a larger-than-life Broadway stage actor. Simultaneously, Lopez reels out guitar riffs and chords that compare to Eric Clapton, filling whatever size venue he is in with sheer musical muscle. 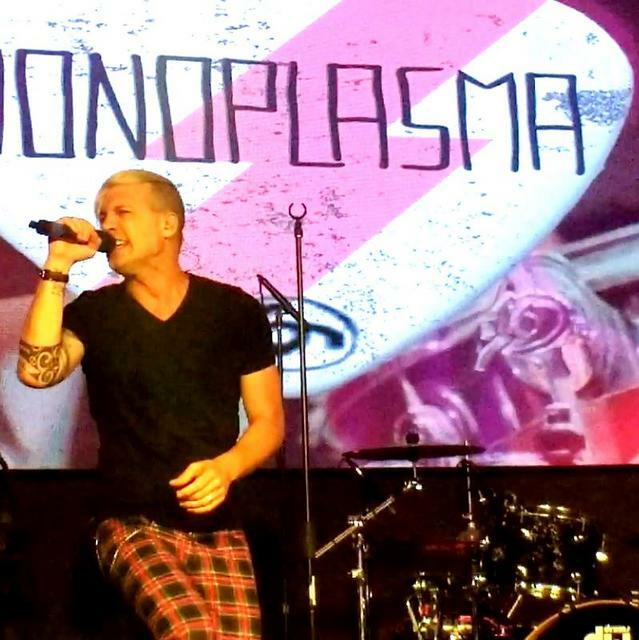 Combined with a world class stage band, Monoplasma delivered a performance that was not only musically electrifying, it was iconic and transformative. While you are in their concert, you are in a crackling universe created by Lopez and conducted by Geronimo. Afterward, you realize that you have returned to what used to be reality. On #tourintermidable Monoplasma plays songs from the album “1” plus new tunes “Memoria” and “Secular” – ten songs in all. Geronimo kept the songs short – less than 4 minutes, to keep thing moving and allow for plenty of time for audience interaction. All the lyrics were in Spanish and the fans were mostly Latino, but as #tourintermidable rolls on through the US (it is now in Texas) and word gets out that this is something very special, audiences should expand to Anglo alt. rock fans. Festival audiences in particular will gravitate to Monoplasma’s energy and engagement that reaches out into large crowds. I have no doubt that they will spread the word as beyond alt. rock to attract rock and psychedelia fans and even some old hippies who just groove on the chords. Building a new band’s fan base demands a lot work as well as talent, even when some of its individual members ae high profile and beloved. Both Geronimo and Lopez are used to the work and have an endless supply of talent They are willing to put the miles on the VW, if it is still running. See them now while you can still get up close and intimate, but even if you can’t, Geronimo knows how to reach you in the back row and Lopez will keep you vibrating no matter how big the venue.